The woodcreepers (Dendrocolaptidae) are a family of songbirds within the extremely diverse order of perching birds (Passeriformes). 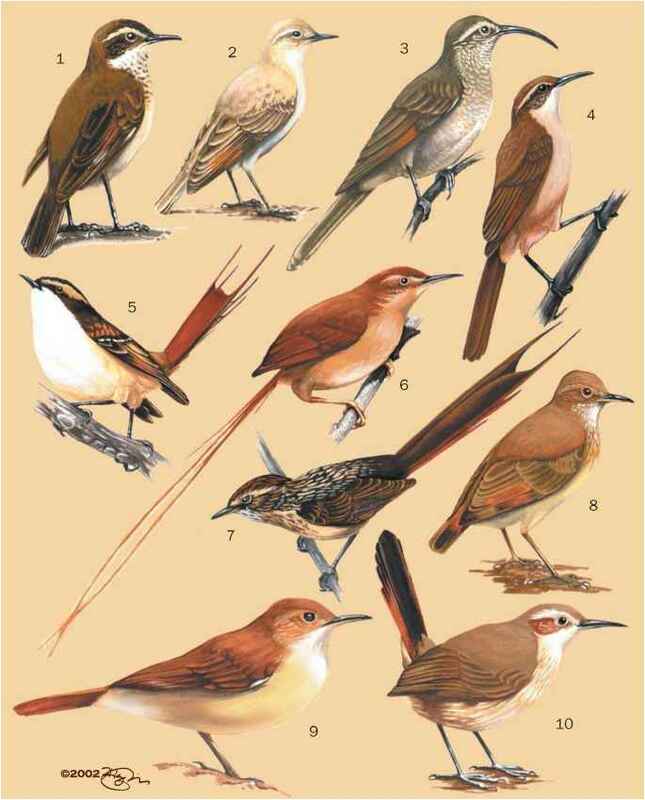 They are believed to be most closely related to the ovenbirds (Furnariidae), ant thrushes (Formicariidae), cotingas (Cotingidae), manakins (Pipridae), and tyrant flycatchers (Tyrannidae). Some avian systematists, however, consider the Dendrocolaptidae to be a subfamily of the Furnariidae (naming them as Dendrocolapinae). 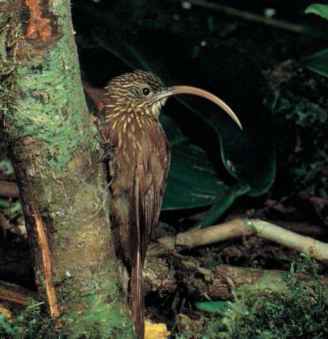 The wood-creepers resemble the creepers (Certhiidae), a Northern Hemisphere family, but this resemblance is because of convergent evolution, as the families are not closely related. The woodcreepers are divided into 13 genera and 52 species (depending on the taxonomic treatment). Woodcreepers have a body length that can range from 5.5 to 14 in (14-36 cm). They have a rather slim body, long rounded wings, and a long graduated tail with 12 outer feathers (or retrices). The shafts of the tail feathers project beyond the broad vanes as sharp, downward-curving spines. The legs of woodcreepers are short and the feet are strong, with long toes and strong claws. The bill varies greatly in size and shape, ranging from a 3-in (7 cm) long, strongly down-curved, sickle-shaped bill at one extreme, to a short, laterally compressed bill at the other. The plumage is typically dull brown, brownish olive, brownish red, or brownish yellow, and is usually striped, banded, or spotted. The sexes have a similar external anatomy and coloration. 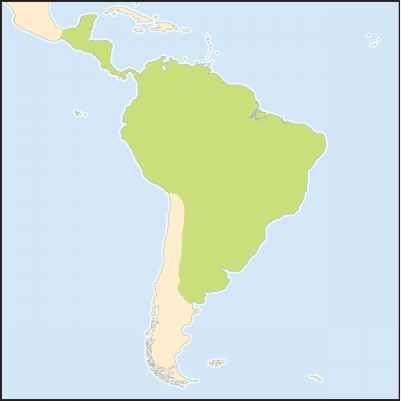 Woodcreepers occur throughout the tropics of Central and South America, ranging from southern Mexico to northern Argentina. The greatest richness of species occurs in tropical Amazonia. Woodcreepers occur in many types of humid tropical and montane forests and brushlands. Woodcreepers are non-migratory birds, remaining all year within their general breeding area. They do not form flocks, but some species live in pairs all year. Some species associate with mixed-species foraging flocks of other species. Wood-creepers roost at night, always singly, in natural tree-cavities or old woodpecker holes. Their songs are pure, simple, clear melodies. Often the song is a soft trill or a long sequence of loud, ringing, similar tones. They sing mostly at dusk, often while feeding. Woodcreepers feed on insects, spiders, and other invertebrates, for which they search in clefts in bark and among mosses, lichens, and epiphytic plants growing on tree-limbs. While looking for food, they clamber up tree trunks, often vertically, using the stiff tail as a support. When they reach the top of a tree, they fly directly to a low point on another one, where they again start foraging upwards. Some species, notably those of the genus Dendrocincla, may follow foraging columns of army ants, seeking insects flushed out of their hiding places by the ants. Some woodcreepers also catch flying insects on the wing, and they may take small lizards. Rarely, they may eat small fruits. Woodcreepers build their nests in old woodpecker excavations or in natural cavities in trees. The nest is made of fine rootlets, pieces of bark, lichens, and strands of plant fibers. They lay two or three white eggs. In almost all species, both parents share in building the nest, incubating the eggs, and rearing the young. 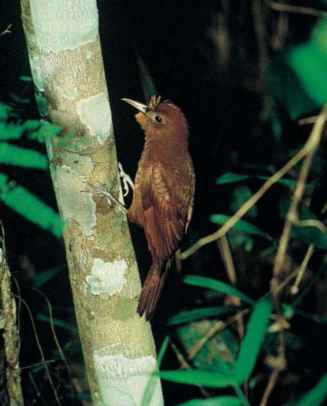 In the tawny-winged woodcreeper (Dendrocincla anabatina ), however, only the female incubates the eggs. The incubation period is 15-21 days, and the time to fledging is 19-23 days. In most species, the older nestlings and fledglings roost in different holes from each of the parents. 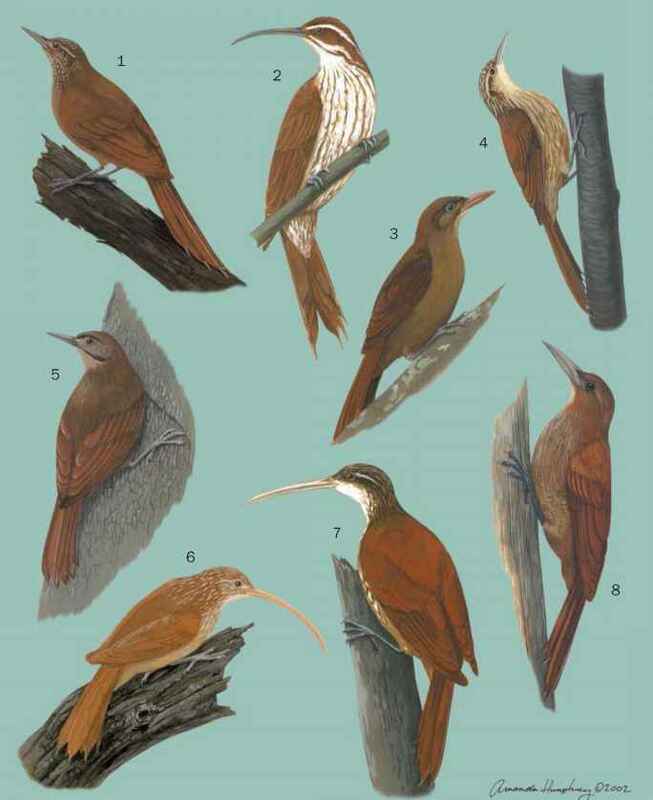 IUCN lists one species, the moustached woodcreeper (Xiphocolaptes falcirostris), as Vulnerable. This species inhabits the dry tropical forests of the interior of eastern Brazil. It has declined greatly in range and abundance because almost all of this habitat type has been converted to agricultural land-uses or is being harvested to provide raw material to manufacture charcoal or paper pulp. The greater scythebill (Campylorhamphus pucherani) of the tropical forests of Colombia, Ecuador, and Peru is listed by IUCN as Near Threatened. Other species have also declined significantly in range and abundance, mostly because of extensive habitat loss or disturbance, but are not yet considered to be at risk. Woodcreepers are of no direct importance to humans, other than the indirect economic benefits of ecotourism associated with tropical birdwatching.